The Authority provides piped water to various service areas in Grand Cayman and Cayman Brac. Please click here for a map of our service areas. If your development is within the Authority’s piped water service areas, please see the Start section to learn how to request a new connection. Please note that developments in the Seven Mile Beach area and West Bay district will fall within the Cayman Water Company’s service area, not the Authority’s. Developments outside of the piped water service areas are advised to have an alternative potable water source. 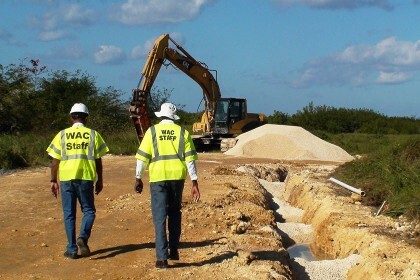 Development of a subdivision at any location in Grand Cayman requires that the developer install water supply infrastructure as per the Authority’s standards. Please note that water service lines (stub-outs) shall be installed by the Authority upon successful completion of a pressure test and prior to the subdivision roads being paved at a cost of $280 per lot. A more extensive guide to constructing water mains may be found below, along with standard drawings for meter boxes, walls and vaults. Developers and/or their agents are once again encouraged to contact the Authority’s Development Control staff early on in the planning process and throughout the development process as needed to avoid unnecessary costs and delays.